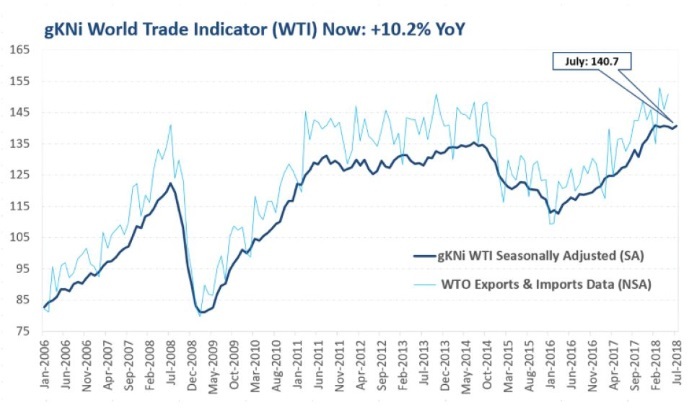 The gKNi World Trade Indicator registered 140.7 points at the end of July, 0.6% higher compared to the previous month and 10.2% higher than in July 2017. North America is running at full speed. On the other hand, Europe and emerging markets are benefiting from a stronger US dollar. 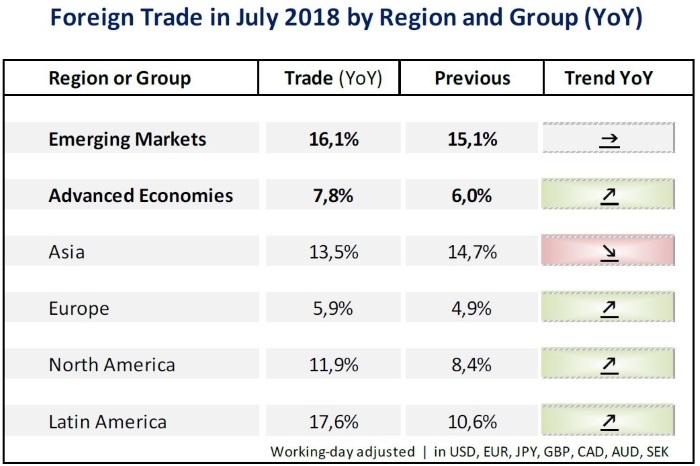 Nevertheless, Asia is losing momentum in August. World Trade Indicator at the end of July 2018, seasonally and workingday adjusted (SA), in USD: 140.7 points, Jan 2010 = 100 points. Export and import data from World Trade Organization (WTO) at the end of May 2018, in USD: 150.8 (+10.6% YoY); Jan 2010 = 100 points. The monthly merchandise values according to WTO are not seasonally or working-day adjusted (NSA), exports are valued FOB and imports CIF. 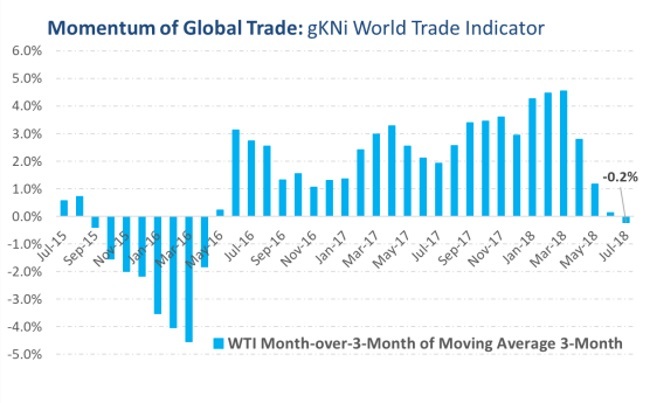 The gKNi World Trade Indicator powered by LogIndex — the data company of Kuehne + Nagel Group — stood at 140.7 (10.2% YoY) at the end of July, +0.6% compared to June. The current reading is almost at the record high achieved in February. The annualized growth rate slowed only marginally to 12.2% in July from 12.5% in June (on year-to-date basis). 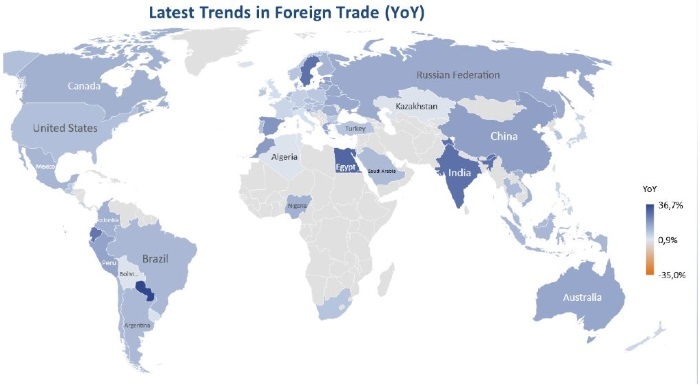 The latest World Trade Organization (WTO) data available for April showed a change of 10.6% compared to the previous year. 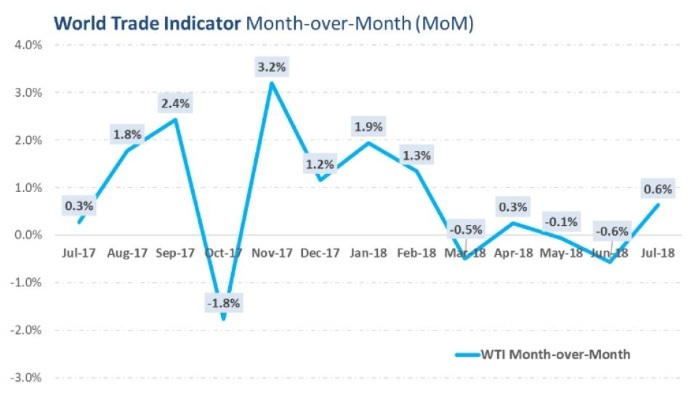 Month-over-Month changes of World Trade Indicator (WTI) past 13 months. This chart shows the Month-over-3-Month changes based on the gKNi World Trade Indicator (Moving Average 3-Month). North America is in full swing: Foreign trade in Canada increased by 12.8% YoY in July (June: 4.7%). 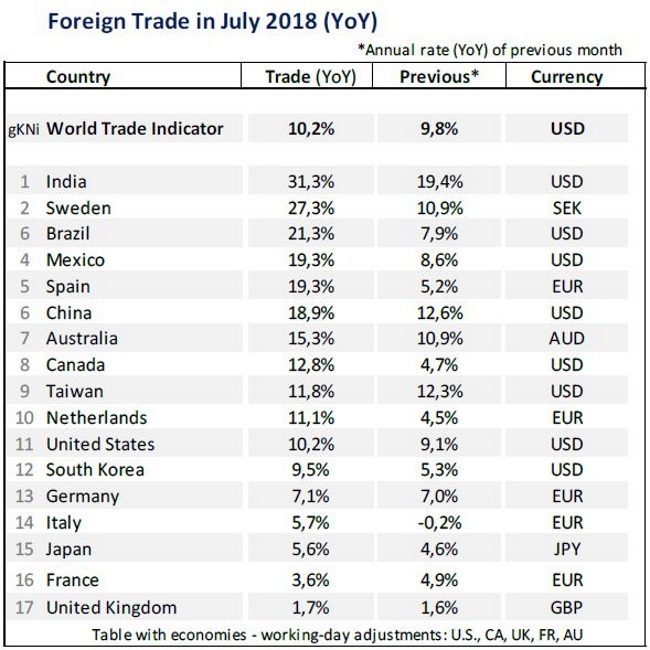 The United States accelerated exports and imports from 9.1% in June to 10.2% (YoY) in July. Europe, especially Sweden, Spain and the Netherlands, is also more dynamic, underpinned by a higher US dollar. However, Asia is developing less dynamically and will slow down further in August. In general, world will cool off slightly again in August. Heat map with the latest trends, derived from LogIndex forecasts and official data of exports and imports, in USD, EUR, JPY, GBP, AUD, CAD, AND SEK (in USD: USA, Latin America, Africa, Eastern Europe, Baltic, Balkan, India, China, Indonesia, Vietnam, a.o.). After a strong second quarter, container traffic on the oceans declined only marginally in July (-0.3% MoM), driven by ports in China (-0.5%) and US (-0.3%). Japanese ports increased the container throughput by 0.8%, Hong Kong 0.3% and Singapore 0.2% (MoM). The gKNi indicator for sea freight is up 2.6% since the beginning of the year, while capacity has increased by 4.1% (TEU). Exports and imports: annual rate of change in July and June (average of export YoY and import YoY). Americas show high year-on-year rates (YoY) in July. However, the annual rate is even higher in India (+31.3%). Furthermore, Sweden, Brazil, Mexico and Spain are pointing to growth rates of 20% or more. The United Kingdom is again one of the larger countries with the lowest annual rates. It is noteworthy that no economy in the sample records a negative growth rate. Over 80% of the countries are experiencing an increasing dynamic (up trending YoY). According to LogIndex forecasts, this momentum is likely to slow in August, at least in Asia. 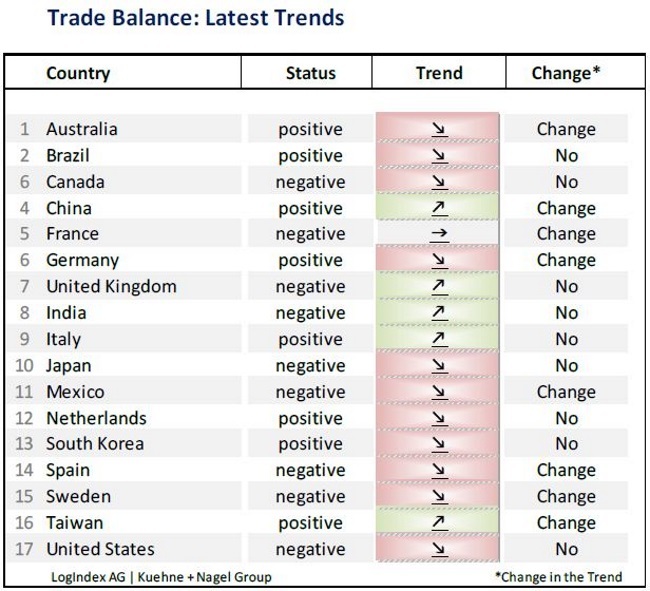 Trend of trade balances by country based on LogIndex forecasts: downward arrow in cases of negative trade balances means a worsening of the situation and vice versa.